Sometimes we get pampered so much by modern technology that we tend to raise the bar of necessity towards the fringes of luxury. 10 years back, a mobile phone was a luxury in my native place. Today, even school children carry one along with them and most of them take it as granted. Similarly, I had been so used to the rich features of SSRS 2008 R2 that I often forget that this feature never existed in the previous versions. Take this case where one of the forum users had asked me how to rotate text in the matrix column header of a SSRS report as shown below. Being used to SSRS 2008 R2, I thought rotating text to 270° was a pretty easy solution but I conveniently forgot that this feature was not available directly in SSRS 2008 and below versions. So I decided to blog down the solution for both SSRS 2008 R2 and other versions. 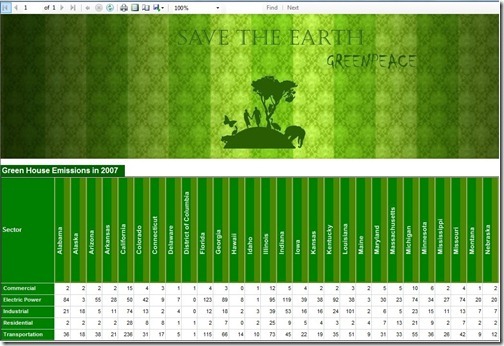 For detailing the solution, I have already created a dataset which will give me the greenhouse emissions of the states in the USA by sector. The requirement is to display all the states in the column header and the optimal way would be to rotate it and display vertically. 1) Select the column whose text you want to rotate and press F4 to bring up the properties panel. 3) Now you can preview the report and the header text should be rotated by 270°. You can also change the horizontal and vertical alignment as needed by selecting the appropriate values in the TextAlign and VerticalAlign properties. Since this option is not available out of the box for older versions, we will have to use custom code in our report. '// Create the Font object for the image text drawing. '// Create a graphics object to measure the text's width and height. '// This is where the bitmap size is determined. '// Create the bmpImage again with the correct size for the text and font. '// Add the colors to the new bitmap. 2) Go to the References tab and add a reference to the System.Drawing assembly. 3) Click OK to save and close the report properties. Then drag and drop an image item from the toolbox to the column header which will popup the Image Properties window as shown below. In the above expression, Fields!State.Value is the field value whose text should be rotated (in this case – State). It can be substituted with any string value also. The second parameter is ideally for the longest string in the values for Fields!State.Value and is just used so that all the text values start at the same position and for general aligning purposes. In the above example, I have directly hardcoded it as “District of Columbia” but you can change it such that the field with the maximum length is passed. (b) there should be a grouping on the column where the image is placed by the Field that you want to group by, else only one value would be displayed. I am sure there is more scope for improvement in the VB.NET code like adding a code such that the text can be left, right or centre aligned, reducing the padding in the left hand side, etc. Feel free to modify and improve the code . Thanks for posting this, Jason. I'm always forgetting that not everyone's operating with R2 yet, and the next time we're dealing client who is, this may come in handy! Thanks!! I have been searching for this solution a long time. Hi, thanks for the 2005 workaround. However, when you the report in Excel the headers are empty… any ideas/more workaround 🙂 Thanks again! I just exported it into excel and I am able to see the headers, although in my case, it has become a little smaller. I am sure this can be adjusted by playing around with the width of the columns and the image. Can you check once again if the headers are being exported? Hmmm… I'm not seeing it. The header row is there but there's no text or image in the cell. Are you seeing text or image? Please remember my SSRS server is 2005. Thanks for looking, I really appreciate your help! Would you be able to send me the rdl file to jason143@gmail.com? Let me have a look at it. nice post – but I have a visual studio 2008 and a RDLC and there I can't get further than point 3 – because I don't have all these options! Many thanks to Jason for resolving my issue with using image in report headers to rotate text at 270! My report already uses image for the same reason but I used Background Image property to set it up. The issue with this is it does not get exported/rendered in Excel. Headers in Excel appear empty. Also, for those of you using VS 2005, follow Jason's steps outlined here BUT don't use the Image wizard. After dragging an image object to the textbox, exit out of the wizard and manually fill the image properties in the Properties pane (F4). Great job, Jason! Remember to do this for both images created and just after the constructors. thanks for the post. i am a newbee…can u pls extend ur help for rotating the entire table instead of a row/col in sql server 2008 r2? Could you let me know why you would like to rotate an entire table? Wouldn't it make the contents hard to read? how to rotate textbox in reportviewer (vs2010) to ccw? Thanks for this, saved me a bunch of time. When I create project for C# . I am not sure what you mean by project for c#, this workaround has to be done inside the rdl for the reports. Thanks for the post, this helped me out a lot! There is a comment above which asks to set the resolution if you are encountering blurry text. Can you make sure you have done that? can you try changing the background color of the textbox to white from NoColor/Transparent? Thanks Melanie, I love it when posts become more of a discussion rather than a one way communication 🙂 I am pretty sure your code is going to help a lot of people and please do keep posting here if you have got more improvements. its working fine, but headers are not coming fine while exporting to EXCEL. It's Working Bt can't modify the font of image. also; if you experience troubles with alignment in HTML with Rotate270. Set the properties CanShrink ans CanGrow to FALSE. Any help on merging headers and cells of report result while exporting to excel ??? Just had to use this on a SQL2014 deployment. Rotated Text wasn’t showing up in IE11, was fine in Chrome (50.0.2661.102) , go figure. Of course rendering is always a bundle of laughs when trying to achieve cross browser compatibility. I am using Melanies variation so I can control the forecolor and backcolor. Anyway this worked on IE but didn’t show up in Chrome, so no further on. I fiddled with various settings to get it working. I added some padding around the image so the text centred better, amended the code to render Png not Jpeg and amended the MIME TYPE accordingly. None of which seemed to make much difference. I then altered the sizing property of the Image to Autosize. This fixed it straight away. I did have an Action on the image to link to another report, but this didn’t seem to make any difference when I removed it. Just some feedback in case anyone else hits these issues. And a huge thank you to both of you. Can you please give us he code for how to rotate text in 360 degree. Thank you for using the green house emissions data in your helpful example. It was therefore doubly nice to come across your posting.